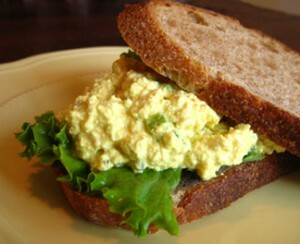 Egg salad sandwiches are some of the easiest sandwiches in the world to make, especially if you have some hard boiled eggs sitting around in the fridge (like around Easter). I’ve found the best combination for a great egg salad sandwich is using toasted rye bread, and including a bit of dill with the mayo, celery, green onions and egg of the egg salad. The amount of mayonnaise is really a matter of taste, it all depends on how mayo-y you want your sandwich. The dill comes from a suggestion from my sister Denise; ever since I learned this trick from her I add it every time. The dill just gives the egg salad a little unexpected lift. There are so many variations you can use, just add a celery seed if you have no fresh celery. Use some stone ground mustard along with the mayo, delete the onion and add a teaspoon of lemon juice, it changes the entire taste. I really prefer Miracle Whip to mayo…but I’m not always the one eating it… Kenny likes the fresh celery and onions, for me this is my all time favorite easy recipe. Bring eggs to a boil, cover the pot and turn off the burner. Let the eggs sit for 20 minutes, shell and rinse. Then cut of the eggs (kinda chunky) add remaining ingredients. I usually like to refrigerate for an hour or so before serving.